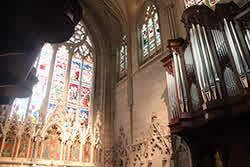 The mission of Saving Grace NYC is to promote and effect the historical preservation of Grace Church in New York. 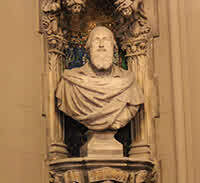 Bust of James Renwick, Jr.
New York City’s earliest example of Gothic Revival architecture, Grace Church has been a steadfast fixture in Greenwich Village since its consecration on March 7, 1846. Designed by famed architect James Renwick, Jr., Grace is a cultural icon, a clear embodiment of the style and elegance of a past time. From the beginning, Grace’s scope was ambitious. When the site was chosen in 1846, all that existed in the area were vast apple orchards and sprawling forest stretching the entire length of Manhattan. Renwick, then 24 years old, had never built anything. He was endowed, however, with a clear purpose and noble intention. He pored himself into the project, and created the foundation for an architectural movement in the United States. While he is best known for St. Patrick’s Cathedral and the Smithsonian Institute, Grace remains distinct in craft and standing. Throughout the next 150 years, Grace Church grew as an important center for culture, education, and service. The small parish established mission churches throughout the neighborhood, created a renowned preparatory school, and launched successive renovations and expansions to the campus. Grace Church holds three celebrated distinctions: New York City Landmark (1966), National Register of Historic Places (1974), and National Historic Landmark (1977). Grace Church has had an eventful history, spanning decades of tumult and triumph. From the City’s humble beginnings, through the turn of the century and the rebirth of the neighborhood as a counter-cultural mecca, Grace has remained a constant force, a defining character in New York City’s storied past. We are committed to preserving our landmark building. While we are proud of the progress made, we are conscious that there is still much to be done. As a living, breathing church community, Grace is in constant use, from worship, to concerts, to open access hours throughout the week. It is up to us to ensure that Grace lives on for the next 150 years, and beyond. With your support, we can preserve our piece of history.